Don your red, white and blue and celebrate Independence Day by enjoying the many activities in central Arkansas. Happy Fourth of July! Don your red, white and blue and celebrate Independence Day by enjoying the many activities in central Arkansas. Events include water activities, music, crafts, parades, fireworks and more. Happy Fourth of July! 17th Annual 4th of July Family Celebration at Sherwood Forest: Munch on free hot dogs and chips (while they last! ), and enjoy entertainment and a fireworks display to close out the evening. July 4 from 6-9 p.m. For info: (501) 833-0476, Facebook. FREE! 35th Annual Pops on the River at River Market: Be part of a central Arkansas tradition, which includes free children's activities, a shopping marketplace, food trucks and lots of entertainment. Entertainment inside the First Security Amphitheater includes the “Oh Say! Can you Sing?” contest, live music, Salute the Troops campaign and the Arkansas Symphony Orchestra performance. Around 9:30 p.m. sit back and enjoy a glorious fireworks show. July 4 from 3-10:30 p.m. For info: (501) 378-3807, Pops.ArkansasOnline.com. FREE! 42nd Fleet Feet Sports Firecracker Fast 5K: At this race, firecrackers are given out to the first 50 men and first 50 women who cross the finish line. All kids ages 12 and under receive a medal. The course begins at Kavanaugh and University and ends at War Memorial Stadium. $25 until July 2; $30 July 3-race day. Registration begins 6 a.m.; race starts 7:30 a.m. July 4. For info: Facebook, website. Big Bang on the Range at Shooting Sports Complex in Jacksonville: Bring lawn chairs and blankets for lawn seating and a festive fireworks show. There are inflatables for kids and concessions for everyone. Event is special needs accessible. Gates open at 6 p.m., fireworks at 9:30 p.m. July 4. For info: (501) 241-2441, CityOfJacksonville.net. FREE! 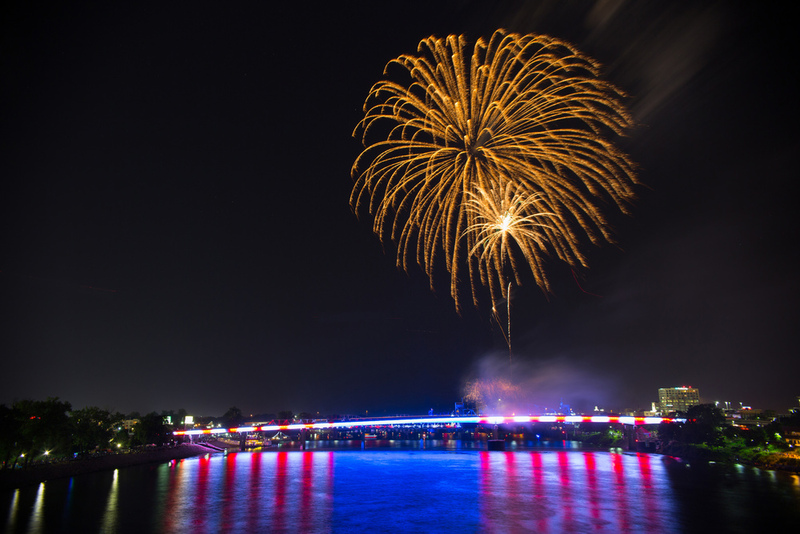 Fourth of July Fireworks Aboard the USS Razorback: Get a great view of the fireworks at this party in North Little Rock. Doors open at 7 p.m., fireworks start at 9 p.m. Donation bar available. Soft drinks, chips, candy bars for purchase. No submarine tours, no outside food or drink. Tickets cost $7 for one or $20 for four when purchased by June 30. Tickets at the door are $10 per person. Children under 5 are free. July 4. 7-10 p.m. For info: (501) 371-8320, Facebook. Fireworks at Dickey-Stephens Park: Head out to the ballpark for fireworks as the Travs take on San Antonio at 6:10 p.m. on July 3 at home. Concessions are open throughout the evening. Enjoy the fireworks after the game from the seats at the ballpark! $6-$12. For info: 664-1555, Travs.com. Fireworks at Lake Hamilton in Hot Springs Village: The fireworks will be shot from the middle of Lake Hamilton from barges located on the east side of Highway 7 at the first Highway 7 bridge. Directly opposite from the Clarion Hotel. July 4. Begins at dusk. For info:www.HotSprings.org. FREE! Fireworks at Magic Springs & Crystal Falls: Spend a day playing on roller coasters and water slides and then enjoy a fireworks display at dusk. July 1 at dusk. Admission $34.99. For info: MagicSprings.com. Frontier Fourth of July at Historic Arkansas Museum: Celebrate Independence Day as it was celebrated on the Arkansas frontier. Activities include an old-time patriotic parade, 19th century music, free watermelon and cold lemonade, and encounters with people from the past. Children can walk on stilts and play other pioneer games, and they'll be invited to take up brooms and wooden rakes to train with the militia. They will also have the opportunity to create flags, streamers and signs to use in the parade. 10 a.m.-noon. July 4. For info: HistoricArkansas.org. FREE! Fun on the Fourth at Pinnacle Mountain State Park: Celebrate and cool off this Independence Day at Pinnacle Mountain State Park. Join park interpreters for a day full of old-fashioned games for the whole family. There will be water balloon volleyball, sprinkler tug-of-war, relay races, and more! 9:30 a.m.-noon. July 4. For info: (501) 868-5806, ArkansasStateParks.com/PinnacleMountain. FREE! July 4th at Wild River Country: Splash and play on the Fourth of July. Wild River Country honors active duty or veterans with free admission with a valid ID. One free ticket per Armed force member. Family members receive $15 admission with dependent ID. Park hours: 10 a.m.-6 p.m. July 4. For info: (501) 753-8600, WildRiverCountry.com. July 4th Events at Mountain Harbor Resort and Spa: Begin the holiday at 8:30 a.m. with a patriotic Fourth of July Four Wheeler Parade. After a heart warming flag raising ceremony with kids, dogs and group singing, the parade rolls through Harbor South and heads to the Lodge. At 9:30 p.m., the lake's largest fireworks displaylights up the lake with patriotic music. July 4. For info: (870) 867-2191, MountainHarborResort.com. July 4th Fun and Games Day at Petit Jean State Park: Join the park staff at the picnic area for a celebration of our nation’s birthday! There will be water balloon volleyball, kickball, a watermelon eating contest, bicycle parade and more! 8 a.m.-5 p.m. July 4. For info: (501) 727-5441, PetitJeanStatePark.com. FREE! July 4th Island Fest at DeGray Lake Resort State Park: Park guests and community members enjoy traditional Independence Day games and activities, including a watermelon eating contest, kayak race, basketball shooting, water balloon games, a 5K and more. Activities culminate for those 12 and under with an Underwater Treasure Hunt in the lodge pool. The traditional fireworks show lights up the night sky over the lake after dark. 9 a.m.-10 p.m. July 4. For info: (501) 865-5810, DeGray.com. FREE! Maumelle 4th Fest at Lake Willastein Park: Celebrate Independence Day in traditional Maumelle style! The 4th of July Parade begins at 4:30 p.m., the Cardboard Boat races begins shortly after at 5:30 p.m. (register here), followed by games, music and more. The evening culminates with a spectacular fireworks show at 9:30 p.m. For info: (501) 851-6990, website. FREE! Independence Day Bash at Saline County Fairgrounds: Families will enjoy helicopter rides, bounce houses, a zipline, climbing wall, mobile video game station and more. The first 300 kids ages 12 and under will receive a free Build-a-Bear ticket. Plus, starting at 6 p.m., families can listen to live music from local bands. The fireworks light up the sky at 9:45 p.m. July 4 from 5:30-10:30 p.m. For info: (501) 776-5970, flyer. FREE!